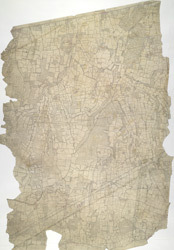 This is an intermediate darwing of a section of the North Downs, with ruled black lines indicating the sheet edges of the finished drawings. The red-ink rays intersecting across the map record the angular measurements taken by the surveyor between fixed triangulation points. Buildings in the main settlements are drawn with red or black outlines: red to indicate buildings of stone or brick, and black for less permanent materials, such as wood.